Product Name: Solid wood floor hangers. √ Small footprint, high storage, you can also dress up your home. 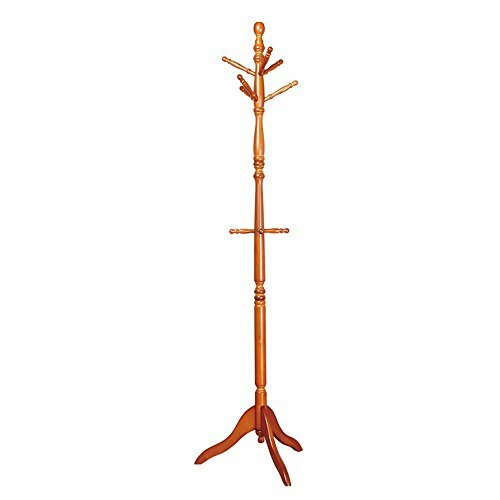 √ Stout pole, strong and durable, equidistant distribution in the main bar, hanging branches arranged in a rotating manner, clothing does not overlap, easy to pay. √ Stable chassis sturdy, high-density material, the weight is higher than the solid wood material, increase stability. √ Anti-skid anti-wear foot pad to prevent product wear and damage to the floor. √ Natural solid wood, environmental protection paint, quality assurance. √All data due to manual measurement, please allow 1 ~ 2cm error to prevail in kind. √Physical taking pictures, due to different lighting, display different, Picture has color difference, is a normal phenomenon, to prevail in kind. √Delivery time is 10-15 days after order, after receipt, not satisfied within 30 days can return. √ Material: solid wood hanger, rubber tree. √ Easy to Assemble: It can be easily assembled with the drawings instruction and it is also easy to clean and remove to wherever you like. √ Saving space: A perfect way to keep your home neat and tidy, hang up your hats, coats and handbags in one organized place.It fits perfectly in the corner without taking to much space in hall or bedroom. √ This coat hanger has a total of 9 hooks to hang your coats, jackets, scarves, hats and more; all hooks have a protective end cap to prevent your clothes from gliding or scratching. If you have any questions about this product by MG Coat Hooks, contact us by completing and submitting the form below. If you are looking for a specif part number, please include it with your message.